ene.field deployed more than 1,000 residential fuel cell Combined Heat and Power (micro-CHP) installations, across 10 key European countries. It represented a step change in the volume of fuel cell micro-CHP (micro FC-CHP) deployment in Europe and a meaningful step towards commercialisation of the technology. The project brought together 10 mature European micro FC-CHP manufacturers into a common analysis framework to deliver trials across all of the available fuel cell CHP technologies. Fuel cell micro-CHP trials have been installed and actively monitored in dwellings across the range of European domestic heating markets, dwelling types and climatic zones, which led to an invaluable dataset on domestic energy consumption and micro-CHP applicability across Europe. 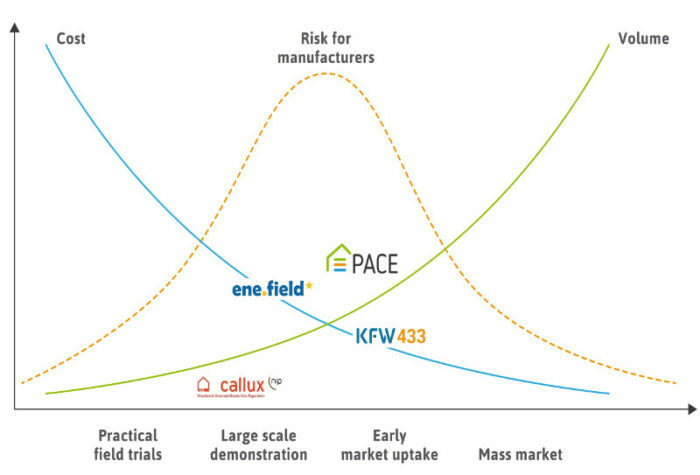 By learning the practicalities of installing and supporting a fleet of fuel cells with real customers, ene.field partners took the final step before they can begin commercial roll-out, pursued by ene.field successor, the PACE project. An increase in volume deployment for the manufacturers involved has in fact stimulated cost reduction of the technology by enabling a move from hand-built products towards serial production and tooling. The ene.field project also brought together over 30 utilities, housing providers and municipalities to bring the products to market and explore different business models for micro-CHP deployment. The data produced by ene.field have been used to provide a fact base for micro FC-CHP, including a definitive environmental lifecycle assessment and cost assessment on a total cost of ownership basis. To communicate clear national strategies on micro-CHP within Member States, ene.field established the macro-economics and CO? savings of the technologies in their target markets and made recommendations as to the most appropriate policy mechanisms to support the commercialisation of domestic micro-CHP across Europe. Finally, ene.field reviewed the socio-economic barriers to widespread deployment of micro-CHP and disseminated clear position papers and advice for policymakers to encourage further roll-out. Based on real world learning: ene.field demonstrated 1,046 units in real customer homes, with more than 5,5 million hours of reliable operation, generating in excess of 4.5 GWh of electricity. Developed a customer-oriented product proposition: ene.field field trial participant surveys show that more than 90% of end users are pleased with the environmental performance, the comfort and warmth, reliability and running costs of their fuel cell micro-cogeneration unit. Laid the foundation for mass market commercialisation: ene.field has proven the technical performance of FC micro-CHP, identified relevant non-economic barriers and outlined possible routes to market. Life cycle cost analysis showed under which conditions FC micro-CHP can become economically competitive at large scale production. Provided evidence based policy recommendations: Adding micro-CHP to the European energy mix generates a gross reduction in infrastructure and operating costs of more than €6,000 for every kilowatt of installed capacity up to 2050, when compared to a scenario with no micro-CHP. FC micro-CHP can reduce carbon emissions, in the range of 370 – 1,100 kg CO2 per year for each kilowatt-electric (kWe), as the energy being displaced by micro-CHP comes predominantly from coal-fired or peaking gas plants until 2050. Comprehensive analysis showed that the policy frameworks at EU and national levels are yet to fully recognise the consumer and system wide benefits of FC micro-CHP. All public ene.field results are available in the Reports section of the website.